This grey Baby on Board maternity T-shirt with a white print makes a great gift for a new mom! With side ruched detailing and a clean silhouette, its a cute way to show off a bump. So comfortable, you can wear it out as a top or sleep in it! If buying it as a gift, choose the size required in the gift box. You can’t live without the basics! Our basic breastfeeding camisole will see you through your pregnancy, look great afterwards and cater for breastfeeding! This longer length camisole features a cotton shelf bra and discreet breastfeeding clasps. Our lace trim pyjama pants are super-soft so you can relax in luxurious comfort. The roll top waist can be worn up over the tummy or rolled down onto your hip, whichever is most comfortable for you. A super easy style in a soft stretch fabric, our little French dress is an effortless basic for your pregnancy wardrobe. The tight fitting outfit will show off your cute bump. This t-shirt dress is perfect for layering underneath a cardi or jacket. Modern and fun!! The Taya Maternity dress is an effortless basic for your pregnancy wardrobe. The tight fitting, stretchy fabric shows off your cute bump. The Taya t-shirt dress is perfect for layering underneath a cardi or jacket. Modern and fun!! This short sleeved basic style in a soft knit is a wardrobe essential. With ruched detailing and a clean silhouette, it’s a must-have that will work at every stage of your pregnancy. Available in a variety of colours, you’ll need more than one… and they even look great layered together! A beautiful cool, sheer tunic with a slight crinkle to fit and flatter you throughout your pregnancy and long afterwards. This ghost voile vest flows over the bump and gently falls to a shaped hemline. Dress it up or wear it over your tankini for poolside glam. Our feminine mesh trim breastfeeding camisoles are a great investment for your pregnancy and breastfeeding wardrobe. Featuring our one-handed breastfeeding clasps that unhook easily to allow you to pull down the top layer and pull up the shelf bra to feed. The cotton lycra shelf bra gives extra coverage and support. You’d never guess this is a breastfeeding top! Flattering and modern, this is that item that makes a style statement both during and post pregnancy. The ruching detail creates a neat shape around your bump and the soft cowl neck allows you to pull aside to access the built in camisole and breastfeeding clasps. A cute, modern pink floral sundress…just perfect for hot Summer days. Featuring a fully functional wrap to cater for your growing tummy, it can also be tied tighter on your post baby figure. Sleek and versatile, this flattering stretch knit maxi skirt will see you comfortably through all stages of pregnancy and look great afterwards. Side slits adds a chic fashion edge and make it easy to move in. 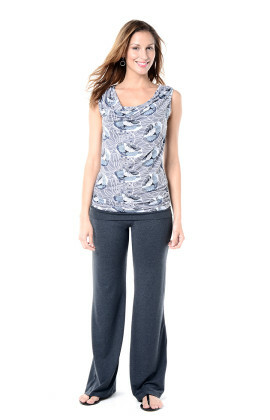 It also has a comfort roll top waist band that can be worn up over the tummy or rolled down underneath. You can even wear it as a dress! For work or weekend, this will be a forever favourite! An “in-between seasons” classic with a softly draped neckline that is cut with a longer length slim fit in a light-weight knit to ensure a flattering silhouette, no matter the size of your bump! Ideal during pregnancy, it is also perfect when breastfeeding. Don’t forget that Summer evenings can get chilly, keep this handy item in your bag! Our signature Annabella top fits in all the right places whilst providing coverage where you want it. The longer length and soft gather detail accommodates the growing belly and looks fabulous post pregnancy. This top is designed for discreet breastfeeding- Simply undo the tie and unhook the one-handed breastfeeding clasp to pull down the cup. You can use the tie fabric to cover the baby’s head while feeding. It also gives extra coverage over the bust and offers support once tied. 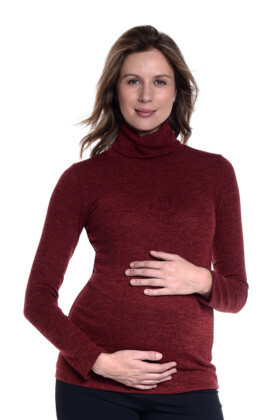 A cosy maternity polo neck is a must have in winter. This melange knit is soft and the snug fit makes it ideal to wear underneath a jacket or cardi. The front has a yoke with some gentle gathers that add a feminine touch as well as extra fullness for the growing bust and tummy. This is a small cut and we suggest buying up a size. Simple, modern and flattering, this maternity tunic is the effortless go-to style to throw on when you need something uncomplicated! The soft melange knit is warm and cosy and has a longer length to cover the bum. The shaped hemline lends a feminine drape and gently softens the silhouette. This gorgeous breastfeeding wrap & tie top has a front opening for breastfeeding that’s cleverly covered by a wrap feature which creates flattering gathers around the tummy area. It looks great on a bump but can also be tied tighter post pregnancy – a bit of camouflage on a new mum tummy! This off-the-shoulder style maternity top with soft sleeves is cool and comfortable to wear through all stages of your pregnancy. The side ties are adjustable so you can choose the length you want to wear it – longer over leggings or a bit shorter with pants, skirts or shorts. Only small available in the periwinkle! Super smart design means you can wear our ruche both as a top AND a dress – layered with leggings for the less brave! Long enough to cover your bum or ruche up and wear with jeans. Satin trim adds a touch of elegance to this pretty lace shrug. A perfect way to dress up your outfit, it also adds extra coverage and bust support to give you a flattering silhouette. This maternity and breastfeeding sports bra by Triumph is really practical and comfortable. Designed to give you support during your workout as well as offering easy breastfeeding with drop down cups. Available in two beautiful and flattering colours.